I can’t believe I didn’t think of this myself. My friend Jill and I were in an amazing health food store last week on the west side and I spied Quinoa Milk. What a great idea! Of course, I had to make it myself. How hard could it be? How about easy. 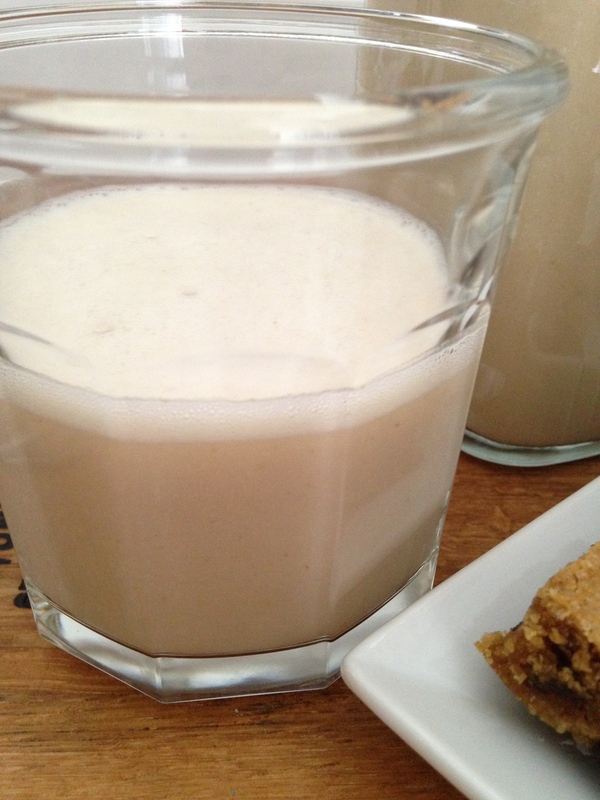 I used the same method as I do for my other homemade vegan milks. The quinoa milk we saw was in New York City and cost $3.99. For 4 servings of a cup of milk, that is about a $1 per serving. A 16oz bag of quinoa can range anywhere from $5.29 to $8.99 depending on the brand, the store, and whether it is organic or not. But there are about 2 1/2 cups of uncooked quinoa from a bag like this. One cup of uncooked quinoa yields about 2 1/2 cups of cooked quinoa. So that makes about 7 1/2 cups of cooked quinoa. This is like a GMAT problem! Now, depending on the price of the bag of uncooked quinoa, you are spending anywhere from $.70 to $1.20 per cup of cooked of cooked quinoa. If you use 1 cup of cooked quinoa to make quinoa milk according to my recipe and you yield about the same that comes in the carton so that is almost 75% off! Same math for nut milks too. Not only that, but if you cook 1 cup of uncooked quinoa for the milk you will have quinoa ready for your next meal (like quinoa with spring garlic and shallots). You can even freeze it to make life really easy. I know that some people will say, yes I see that it is cheaper, not to mention that it is pure and less wasteful, but I don’t have the time to cook the quinoa (which takes almost no effort) and then throw it into the blender (which also takes about no effort). Really? Onto the recipe. The thing about quinoa is that even rinsed, it can be on the bitter side. That is because quinoa is actually a seed – like hemp or sunflower – and Mother Nature, in all of her brilliance, coated the quinoa seeds in saponin to discourage birds from eating it. Always rinse quinoa in a fine mesh strainer before cooking. Quinoa milk tastes, you guessed it, like liquid quinoa. Today I went with a sweet vanilla flavor because my son and I made cookie bars which are essentially my chocolate chip cookies baked in a dish for about 45 minutes instead of round cookies. 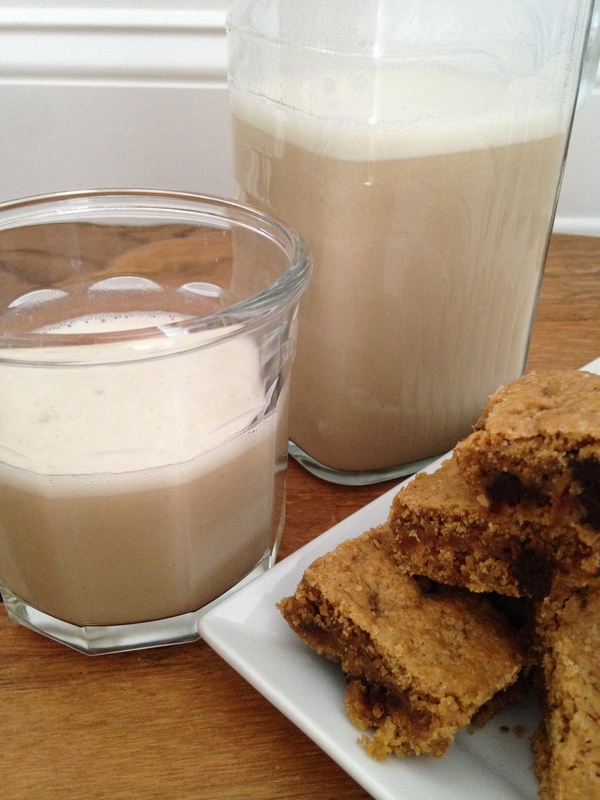 Hello, much easier and I wanted to dip the cookies into a sweet milk. But, that is optional. In fact, make it without the vanilla and dates, taste it and add them later if you desire. Either way let the Vitamix or blender go for a long time and you won’t have to strain it. Place the ingredients into the Vitamix or blender. Blend until completely white and as liquid as possible. Pour into a glass pitcher and store in the refrigerator. Shake well before serving. Enjoy! I didn’t know I wanted or missed quinoa milk until I read your recipe. I’ve heard of different grain milks except for quinoa. I’m seriously going to try this. Looks yummy! I’ve made hemp milk and almond milk. So good! I have the oats to make my own oat milk. Just haven’t gotten around to making it yet. thank you Lisa!! Why didn’t I think of this before hahahaha?? I have made oat milk for the first time today and it is so yummy! And I am also gonna make some Quinoa soon so that I can have a healthy protein milk. Hmmmm I think quinoa milk will make a great banana milk shake yummy! mmm…a banana milk shake! that sounds delish!